The basic ingredients for the Sea, Sky, Sand and Street project came together in a matter of days and, considering that there was no well thought out plan, it worked remarkably well. The idea was straightforward enough. Take an iPhone, a good quality iPhone photography app, sixteen days in the county of Norfolk, a bit of experimentation, and what do you get? An 80 page book with over seventy photographs. Well two books actually! What started out as experimental photographs taken on a mobile phone blossomed out into something much bigger. I will admit that I am a convert to phone photography. The change in my attitude towards mobile phone images really started after picking an iPhone up. Before that the mobile phone camera was a gimmick or a toy of limited use, at least in my eyes. Simply put, it was only suitable for snapshot family photos or capturing a night out with friends. Maybe the early camera phones were exactly that, but the technology and the image quality has moved on at a fast pace. The iPhone (and other smart phones) changed everything. The small size and excellent photo software apps made the phone a camera, darkroom and distribution tool – all in one. 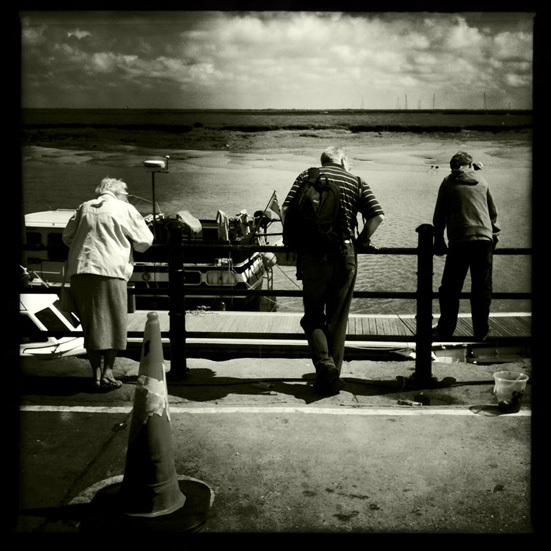 During the summer of 2010, i’d used an iPhone to photograph the making of a film in Whitby for the Solo Photo Book project, an online project where the aim was to create a PDF photography book with 35+ images, in just 31 days. The resulting ‘Polaroid’ type images taken for the project looked great and i really believed that i’d pretty much reached the end of what i could do with a phone. Wrong again. During the summer of 2011, the Solo Photo Book Month project came up again, and I was faced with a problem – i had no idea what to shoot. Just a week before my Solo Photo Book Month project was due to start, i was out taking a few images, here and there, using my iPhone, when i started using the Hipstamatic iPhone photography app for monochrome images. The basic idea for what eventually became the Sea, Sky, Sand and Street book started right there. Simplicity was key, with the images to be displayed in the order they were shot, to form a loose narrative structure guiding the viewer through the various locations. A gritty black and white tone was used to stay away from the distraction of colour and the picture postcard style, as well as make a change from shooting colour as i had on previous book projects. Small mobile phone cameras are innocuous and enable a far greater intimacy with a subject. It was a liberating experience; to point and shoot with a small device, unhampered by camera bags full of gear and reacting to the world around me. Yet many photographers have doubts about the value of iPhone photography. Why shoot on a phone when you can use a ‘proper camera’? Somehow i expect that the early adopters of the 35mm camera may have met with similar remarks. Two factors favour the use of a mobile phone camera like the iPhone – speed and its low-key presence. A camera instantly draws attention as soon as you raise it to the eye – not great when taking candid street photos. The second benefit comes from the phone’s point and shoot use. Often it came down to using the phone just like that – point and shoot. The results were often surprisingly good. Several images taken for the project were literally shot as i walked by – the last shot featured in the gallery being one of the best examples – potential images were often gone in moments. Could i have used a ‘proper’ camera? The answer would probably have to be yes, but the photo opportunities would have been far less frequent and much of the spontaneity would have been lost. One final reason for using an phone was to prove its worth and to push boundaries. Cameras come in all shapes and sizes, and at the end of the day, it’s about whatever works for the photographer whether it be an old shoe box, a 20×24 Polaroid camera or an expensive, state-of-the-art digital camera. An important ingredient to the project was the use of the Hipstamatic app. I hadn’t actually used the app very much until that point and i was pleasantly surprised by the quality of the images produced. The dark black and white, slightly warm toned images stripped away any colourful seaside distractions. Another reason for choosing monochrome was due to the fact that I’d shot the previous two Solo Photo Book Month books in colour, and I really wanted to finally create a monochrome documentary photography book. Having said that, the final Hipstamatic settings really came about more by accident than design. Does the aesthetic styling of Hipstamatic distract the viewer or undermine the photography? It depends how you view photography. Can a photograph be truthful or pure? No would be the simple answer – photography is itself, a filter. To say your photos are pure or the truth seems a rather arrogant statement to make. Does Hipstamatic’s aesthetic ‘manipulation’ differ that much from a dodged and burned darkroom print? I think the difference is negligible, the post production work is just done in-camera, but others will undoubtedly have a different view regarding the purity of the image. It really comes down to your own personal philosophy towards photography, but camera technology in mobile phones has improved immensely in recent years with many people embracing phone cameras to produce new exciting and creative work. Like it or not, the mobile phone camera is here to stay. The images for the book were taken within a sixteen day period from June 23rd to the 9th of July 2011. Locations varied from busy seaside resorts to a quiet place of pilgrimage in an attempt to show the distinctive variety offered by the county of Norfolk. Wells-Next-The-Sea, Hunstanton, Sheringham, Weybourne, Titchwell, Thornham, Brancaster and Walsingham were just some of the locations covered in the project. The pilgrimage village of Walsingham was especially singled out for attention in the book. It’s a fascinating place, often described as ‘England’s Nazareth’, where thousands of pilgrims and tourists visit each year. The notion of a pilgrimage may seem like something out of the medieval era to many, but a steady stream of the faithful, from all over the UK and the world, make their way to the Norfolk village every year. The peace and quiet of Walsingham marks a sharp contrast to the bright lights, colour and hustle & bustle of the seaside resorts, just a short journey away. If anything, the images within the book look at that contradiction, that diversity, and consequently the broad appeal of the county of Norfolk. Even in the era of cheap flights and foreign package holidays, Norfolk is still attractive to tourists because of the diversity and the timeless family seaside holiday experience it offers to visitors. The styles of photography employed over the sixteen day shoot alternated from street photography, landscape, still-life and documentary with the total number of images shot coming to just over 400. This was reduced down at the editing stage to just over 70 photographs for the book and 115 images for the website’s extended gallery. No post production work was done (it wasn’t needed!) on the images before inclusion in the book – the photographs came straight off the iPhone. The only real problem I encountered was thinking of the project name! Two versions of this project exist – the first being the 2011 Solo Photo Book Month PDF book version called Sand, Sky, Sea and Street, and the second being the redesigned full book version with the re-arranged name to help differentiate between the two books. The difficult task of naming the project was finally solved by using the main elements that feature in the photographs. Sadly this turned out to be the final Solo Photo Book Month project i’d shoot. At the end of 2011, the excellent online project finally closed up shop due to growing costs. Of the three books i produced over the four years SoFoBoMo ran, this one was by far the best. It was a great way to end my association with the Solo Photo Book Month project. Favourite photograph: Lots to choose from but if i HAD to pick one, i’d go for the windswept beach at Brancaster with the family (and the windbreak) in the foreground. I’d gone to the beach to photograph a shipwreck but had found that access was difficult (not to mention dangerous!) due to the tide . On the way back to the car, i saw this image. The wind had picked up, blowing sand across the beach, and it looked like a storm was brewing up – Norfolk can produce brilliant summer storms that follow the coast and later that evening a storm did appear. Sat on the beach were the family captured in the photo, tucked in and hiding behind the windbreak. It captures perfectly the typical British seaside holiday ‘whatever the weather’ spirit of endurance.